In 2010, I wrote about Pretzel Rolls and it’s become far and away my most popular post over these past five years. With good reason. They’re delicious, both on their own with a little butter and maybe a drizzle of honey or as the base of a fantastic sandwich. Back when I wrote the post, I wasn’t happy with what I could find at the stores; they were always slightly stale and I found this incredibly annoying. Why do we continue to buy subpar bread? So I decided to call it quits developed my own recipe. They’re not overly difficult than any yeast dough but with the added step of a baking soda poach to get that characteristic chewy brown crust. Shortly thereafter, I used the dough to wrap all beef hot dogs for a much better version that what you can buy. Then I just sat back and absentmindedly watched the hits, pleased that others found them as enjoyable as I did. I still love pretzel rolls though they’re more common these days, available even at the local Jewel (and yes, a little stale.) I felt it was time for an update and with the Superbowl tomorrow, that mega session of eating, shouting and questionable halftime shows, I had an idea. Since the summer, I’ve been quite enamored of pimento cheese. I was going to stuff a pretzel with pimento cheese. Oh yes I was. Surprisingly, these really aren’t that difficult. A project, certainly, but certainly do-able especially on this wintery, snowy day. They also have the added benefit of brightening up my kitchen through yet another snowstorm. Old Man Winter is pissed this year. Maybe I’ll make him a pimento cheese peace offering. The directions are lengthy, yes, but I’ve taken care to describe every step in some detail. 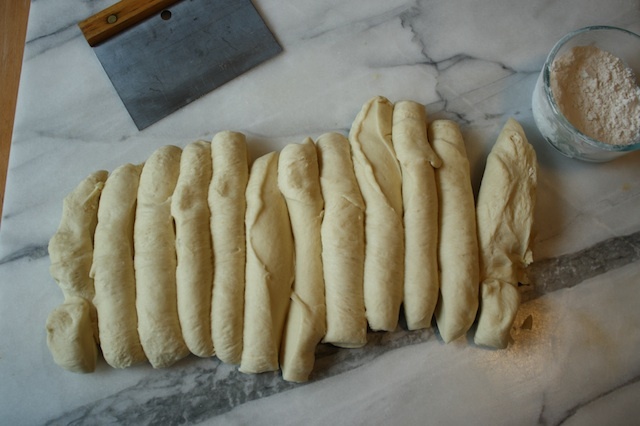 You basically make the same dough recipe, roll it into long strips, pipe a stripe of filling and encase it in the dough. 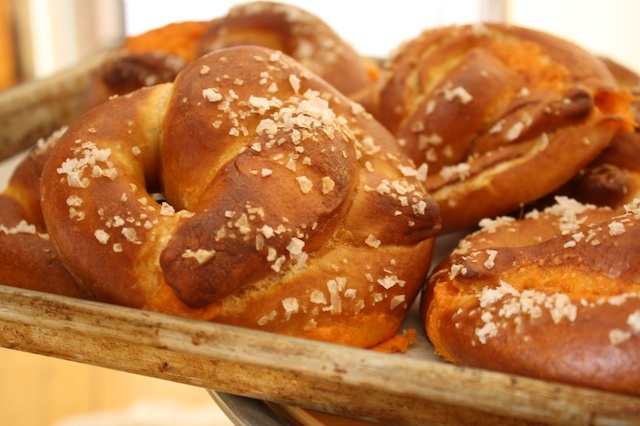 A little roll and a twist and you have your pretzel shape. Rise, poach, egg wash, salt and bake. A word on piping: you can certainly spoon the filling on but I feel strongly that piping makes a much neater, tightly filled pretzel. Even if you have to put together a hack system with a heavy duty Ziploc bag, it’ll be much easier to get that filling on the dough. My first batch or two had the great misfortune of blowing out, i.e., losing the filling, so it took a few tries to get it right and I added some cornstarch to absorb excess moisture during baking, invoking the fondue theory of cheese melting. I think it helps butsome of the filling will leak out regardless. Do not fret. The cook’s treat is the crispy little bits that stick to the pan. It would be a shame to bake perfect pretzels and miss this. Start these in the morning and they’ll be ready by kickoff. 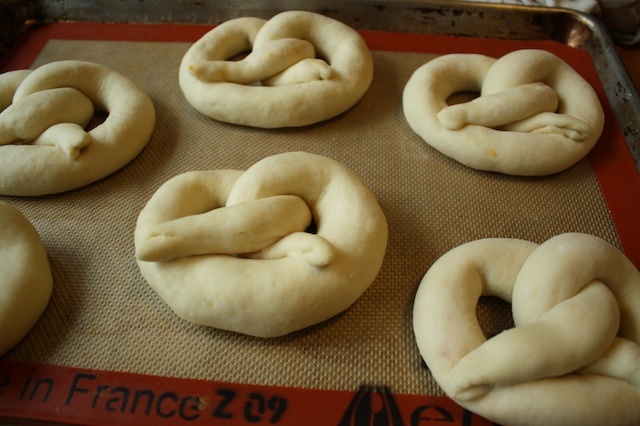 Keep in mind, if you’re not into the pretzel shape you can make filled rolls or sticks. It really doesn’t matter, just get the filling in the dough in any way you see fit and make sure you seal it really tight. STRESS THERAPY BAKING FACTOR: PRETTY GREAT. Pretzels and cheese? YES. Need I say more? for the dough: Combine the water and the yeast in the bowl of a standing mixer and let rest 5 minutes until foamy. Line two sheet pans with parchment paper or Silpat mats. Set aside. Note: the pretzels tend to stick to the parchment so I greatly prefer Silpat mats. If using parchment, spray with cooking spray. for the filling: you can blend everything by hand but I prefer the mixture rather smooth and use my food processor. First, with the grating blade, grate the cheese and transfer to a bowl. Replace the grater with the regular mixing blade and pulse together the cream cheese, cornstarch, salt, pepper and hot sauce. Add half the cheese and blend until the cheese is pretty broken up. Add the remaining cheese and blend until somewhat smooth. Add the drained pimentos and pulse until just blended. Taste and adjust seasoning if needed. Can be made up to 3 days ahead, keep tightly wrapped in the refrigerator. 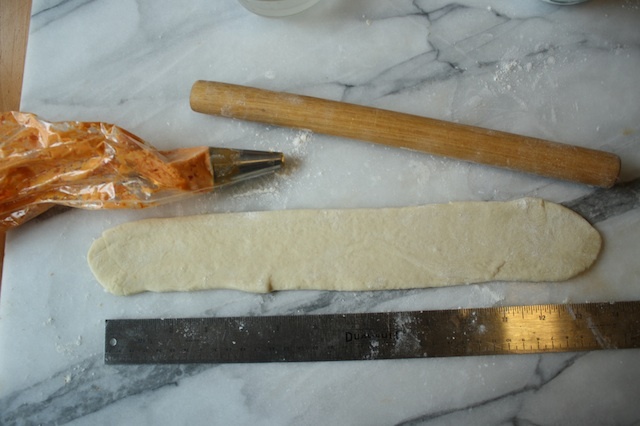 Transfer the filling to a pastry bag fitted with an open round tip, about ½”. The Ateco #804 works great if you have it. Do not fill the bag more than ½ full so it’s not too unwieldy. to fill: Pat the dough into a rectangle and cut, with a dough scraper, into 12 even pieces. Each should be about 3-3 ½ ounces each. 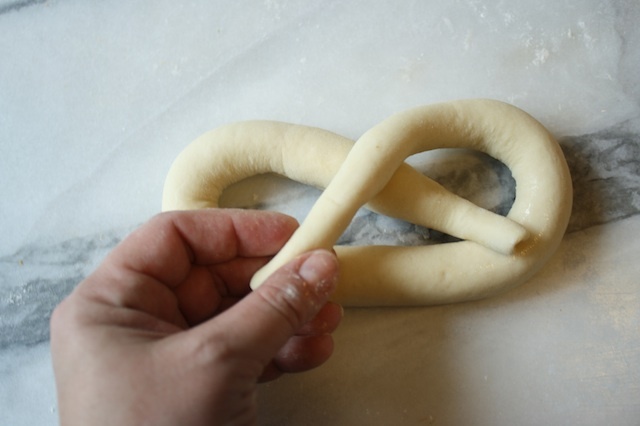 Take a dough strip and lightly pat with your fingers to flatten. Lightly flour the surface if needed to prevent sticking. 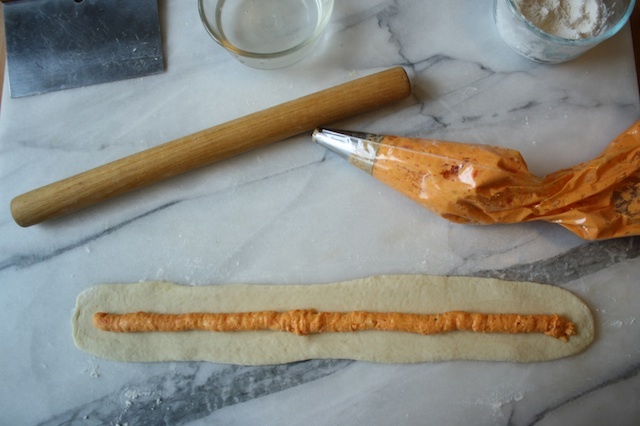 With a rolling pin, roll the dough into an even, flat piece about 13” long x 2” wide. 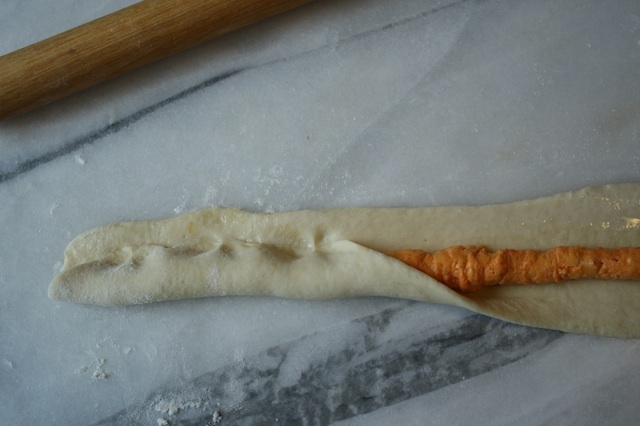 Pipe a long thin, continuous strip of the filling down the center of the dough, leaving about ½” clear on each end. With your fingers and a bit of water, dampen the far, long edge of dough on the far side of the line of filling. Take the side of the dough closest to you and pull it up and over the line of filling, pushing the edge down with you fingers on the far edge of the filling to seal. Continue down the length of the dough. Pull the dough edge on the opposite side of the filling – the wet side – up and over, pinching lightly to seal. Take care not to break through the dough to the filling. 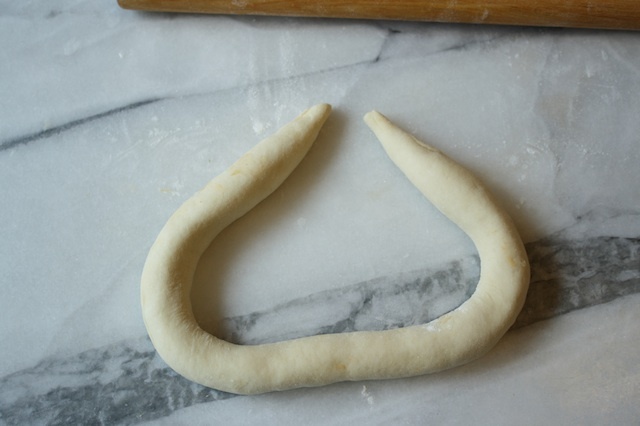 Pinch the ends to seal then with the palms of your hands, roll the dough rope to even out the rough seal. It also helps to use the sides of your hands and roll the edges to get a good seal, using a sort of karate chop motion. 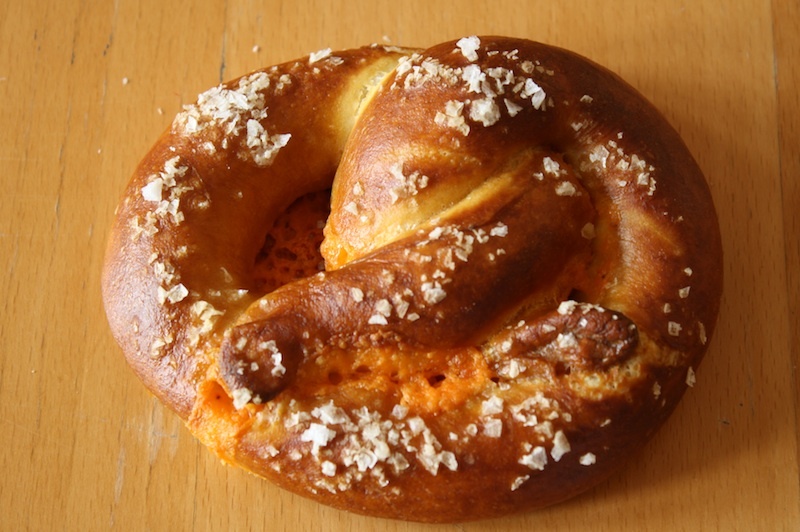 to shape: you know have a cheese filled rope that needs to be shaped into a pretzel. First, take the ends and make a “U”. If you can, try to have the seam on the top – it seems to help reduce filling blowouts. Loop the ends around and cross them over one another. 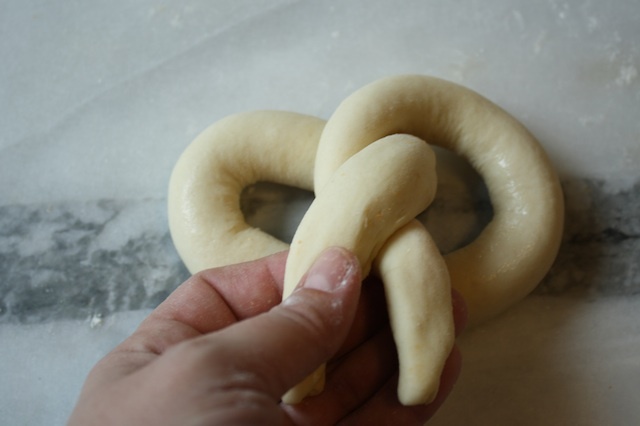 Give the ends a twist, then place each end on the bottom edge of the pretzel, sealing with a little water. Look at the pictures – it’s not as confusing as it sounds. Place on the prepared sheet pans, cover with plastic wrap and let rise in a warm place for ½ hour until puffy and doubled somewhat in size. to poach: bring a large shallow pan of water to a boil. Reduce the heat to a simmer and add the baking soda. 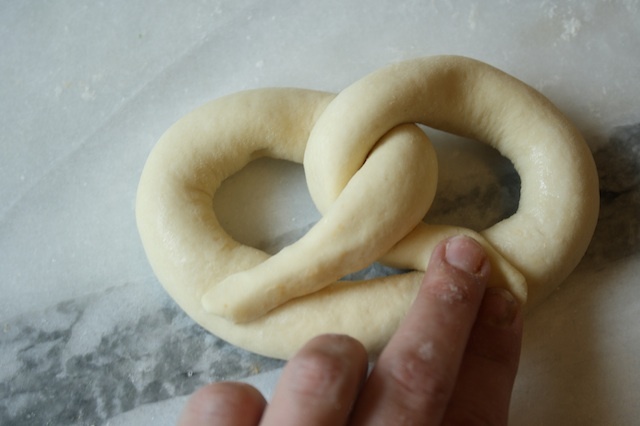 Gently slide a pretzel or two into the poaching liquid, top side down. Poach for 20-30 seconds. 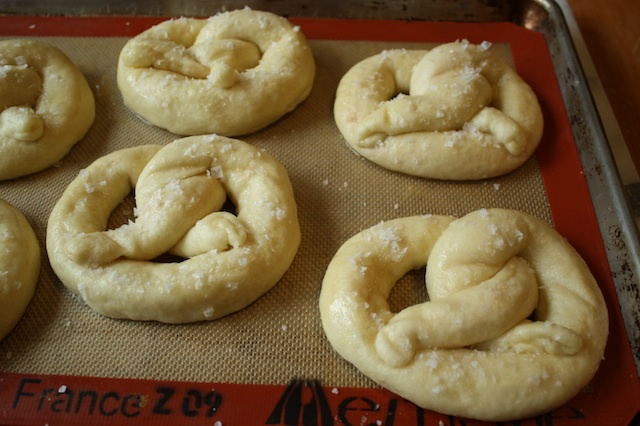 Gently turn the pretzels over and poach the bottoms for an another 20-30 seconds. You’re going to have to find the tool that works best for you – sometimes I use a slotted spoon, an offset spatula or a spider. Sometimes a fish spatula works best. Just be careful and if you can manage it, flip them away from you to avoid splashing. Remove the poached pretzels from the liquid and place on the prepared sheetpans, spacing at least 1-1 ½” apart. Continue with the remaining pretzels. glaze: Whisk together an egg and 1 teaspoon water until smooth. 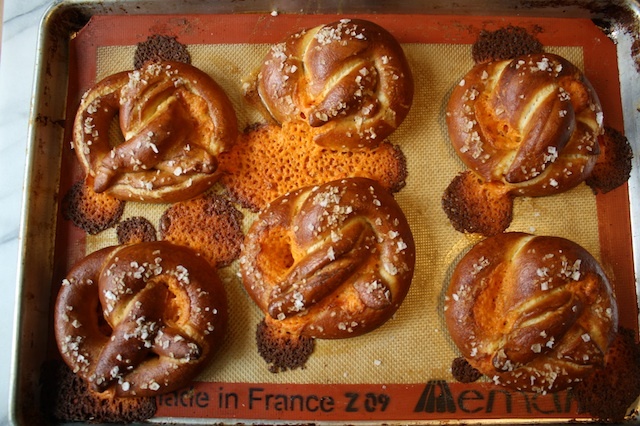 Brush each pretzel with the egg wash, taking care to cover all surfaces. Sprinkle with the salt. bake: Bake the pretzels for 15-20 minutes, rotating the pans halfway through baking – top to bottom, front to back – for even browning. Cool completely – though they are pretty great warm. Pretzels are definitely best eaten on day of baking but they store OK in the freezer, tightly wrapped. Reheat in a damp paper towel for 30 seconds in the microwave. Dear God, Santa, Buddha or whomever can help me. I need these in my belly now. Puleaaaassse!